I received my Venue 11 Pro Mobile Keyboard (what I like to call the keyboard dock) from Dell the other day, and I’ve spend a few minutes running it through its paces. The short version: it works as you’d expect (most of the time), is comfortable to type on, has a decent trackpad, and adds considerably to the tablet’s running time via a built-in battery. Before I go into the keyboard’s, I’ll mention its biggest negative. In short, the keyboard and tablet often loss connectivity, requiring a physical disconnect and reconnect to get things working again. From what I’ve read in forums and such, this is a common problem that Dell has yet to address. It’s a real frustration, and detracts significantly from the keyboard’s functionality. Otherwise, the keyboard is a nice addition to the Venue 11 Pro. They keys are nicely spaced for such a small keyboard, and offer up a comfortable feel. I was able to ramp up fairly quickly to my full 80 wpm typing speed, which is impressive. The (relatively small) trackpad works surprisingly well, both for simple mousing and using gestures. All Windows 8.1 gestures are supported, and two-finger scrolling and pinch-to-zoom works surprisingly well. Oddly enough, scrolling doesn’t work in Chrome, although it does just fine in other desktop apps—combined with the touch issues I’ve noted elsewhere, I’m beginning to think that Chrome simply doesn’t like the Venue 11 Pro. They keyboard feels solidly built, and adds some heft to the tablet/keyboard combo. This is a good thing, because it makes balancing the duo on one’s lap a practical proposition. If the keyboard were any lighter, it would simply tip over from the weight of the tablet. As it is, the tablet is propped at a comfortable angle for working on a desktop or one’s lap, and since the fans are in the tablet and pointing up, there’s absolutely no heat to worry about and no vents to avoid covering up. 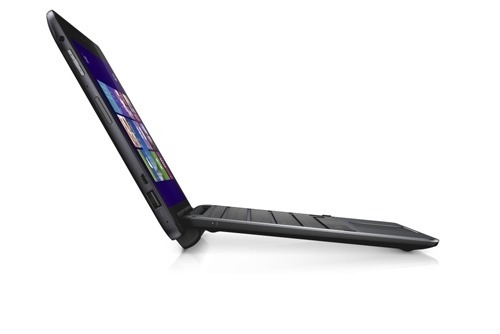 When paired, the combo makes for a rather thick and heavy little ultrabook, although not egregiously so. I’d feel as comfortable carrying around the docked Venue 11 Pro as I do my MacBook Air 13”, and probably more so. In fact, if I planned on keeping the Venue 11 Pro, my MacBook would likely get far less work. Although the screen’s a little small at 10.8”, the ability to swap between tablet and ultrabook form factor would be great for productivity. I’ve not done any exhaustive battery tests with the Mobile Keyboard, but I’ve no doubt that most users could get an entire day’s use out of the combo. As far as I can tell, the Venue 11 Pro draws from both its internal battery and the keyboard during use and standby, although it draws more from the keyboard. 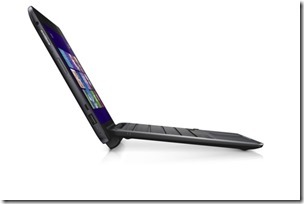 This means that significant power remains to the tablet when the keyboard’s battery runs out, which makes sense. 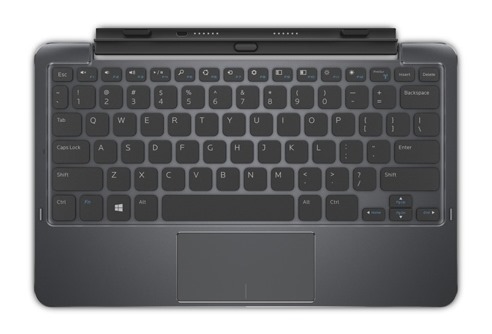 I don’t believe that the keyboard charges the tablet, however, as I remember being the case with the original ASUS Transformer keyboard dock (and perhaps subsequent models as well). There’s no way to charge the keyboard by itself. Instead, you connect the keyboard to the tablet, and then charge the tablet. Sorry, there’s actually a charging port hidden on the docking port. So, you can charge the keyboard by itself. The keyboard will also charge when connected to tablet when it’s charging. I have no idea how long it takes to charge both together, however, because I do my serious charging overnight. Although it’s a little pricy at $159.99 on the Dell site, I’d say that if Dell can fix the connectivity issues, the keyboard’s well worth the price. Not only does it add a fine keyboard and trackpad to the Venue 11 Pro, it also significantly increases battery life. I’d rather see some additional ports added to the Mobile Keyboard—an extra USB port or two would be welcome, but even as is I find it a moderately good value. However, the connectivity issue makes it hard to recommend the Mobile Keyboard at any price. Given Dell’s ongoing issues with the Active Stylus, I’m a little reluctant to depend upon them to resolve this problem any time soon. If you can put up with some inconvenience, however, get the keyboard and you’ll have a fine little productivity device.